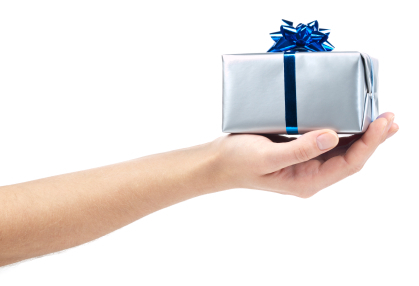 The TurboTax Blog > Taxes 101 > What is the Gift Tax? Did you know that the government imposes a tax on large gifts? This may come as a surprise to some. After all, you’re simply giving money away, usually to family, only to find out the government wants to tax you for doing so. You’re probably thinking that isn’t fair, but the tax was created to close a bit of a loophole. The reason this tax comes into play has to do with the estate tax. Without a gift tax, someone could give away all or most of their money right before death as a way to circumvent the estate tax. Now, you may also argue that the estate tax also isn’t fair, but that’s a discussion for another day. There is some good news. First, the amount of the gift that triggers the gift tax is relatively high which means most people will never have to worry about it. Second, the gift tax threshold is reset annually, and is on a per-person basis. For 2010 and 2011, that individual annual amount is $13,000. So, if you have two children and you wanted to give them each $13,000 you could without triggering the gift tax. To sweeten the deal even further, the gift tax is an individual one, so if you’re married, you and your spouse can each give $13,000 to an individual each year, bringing the annual total up to $26,000. Let’s say you wanted to give each of your two children $20,000 this year. That’s more than the $13,000 per person annual limit. So what happens is you give them the $20,000, but then the $7,000 excess for each would then be applied to your lifetime limit. In this case that’s $14,000 total that goes against your lifetime exclusion. You’d still have to file the IRS gift tax form to record this excess, but you wouldn’t owe any gift tax on that money. The general rule is that any gift is a taxable gift. However, there are many exceptions to this rule. Generally, the following gifts are not taxable gifts. How many gifts (money) can I get from different people before being tax.. So can 3 different people give me 13000 each a total of 39000 in one month and I would not be tax? No you would not be taxed. The people giving the money to you would be taxed on any amount over $14,000. Confused TP et al. First, the giver, not the receiver is taxed on a gift over $13,000. The giver is the one that is supposedly trying to avoid inheritance tax. Gifts are not taxable income, so the receiver doesn’t have to pay any income tax. Nancy, you can either spread the payments over 4 years or deduct the amount that is over $13k x nr of sibs from your $5M lifetime exclusion. Note the lifetime exclusion is $5M this year. It could be more or less in the future. Although you are responsible for the tax, I would negotiate with sibs that you deduct the tax from their share if they insist on immediate payment. Put it in a safe investment, and give them their share plus interest annually until it’s paid out. I bought parents farm, I have to sell some land to pay siblings 43,000.00 each. I thought I pay capital gain, and they pay gift taxes. Could you explain who has to pay what? If the person giving the gift doesn’t have to pay taxes on it, then what about the person receiving the gift? Would the recipient have to pay taxes on a gift that falls below the $13,000 threshold?